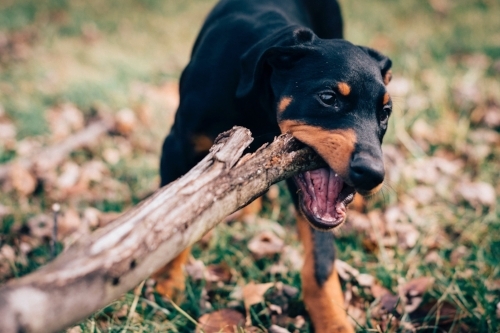 Fact: dogs love to chew anything...no matter the size! Dogs love to chew anything from your old college slippers to your expensive shoes (dogs do not discern between a $5 pair of slippers to a $1000 pair of pumps). If an item meets the dog's chewing standard, it is fair game! The number of items are destroyed due to their chewing addiction can deprive your house of shoes and other prized items. Chewing is something that comes naturally to dogs and we don't want to suppress that instinct from them. You want them to chew...just not your stuff! Dogs need to chew as it keeps them occupied both in body and mind! Have you ever seen a dog chew? Once they latch onto something they like and chew... they are in the zone! There are many benefits of chewing for dogs such as mental stimulation, oral health, and stress release. Dogs need to be physically and mentally stimulated as well. 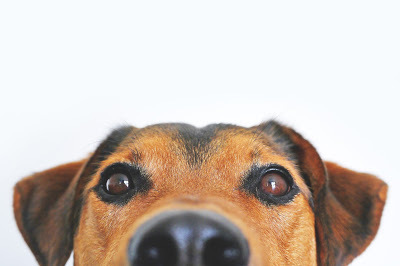 Although long brisk walks and fun play dates at the dog park provide great exercise, chewing helps them to concentrate and provides mental stimulation in doing so. Chewing also helps with oral health by keeping their teeth clean, removing the plaque and tarter. Teething puppies get relief by helping to sooth the discomfort of those new chompers coming in. It helps to exercise their jaw muscles too! Chewing is an excellent way to keep your dog’s oral health in top shape. The act itself exercises the jaw muscles, scrapes plaque and tartar off of the teeth and soothes the discomfort of a teething puppy. Further, raw bones provide enzymes that help break down the tartar in your dog’s teeth, leaving them cleaner and their breath fresher. Chewing also smooths the teeth and makes it more difficult for periodontal disease to move in. Tooth and gum disease is an ever-growing problem in our dogs today, so keeping their teeth clean and healthy is important. No mom...I didn't chew your heels...it was the cat! The problem is that many chew toys on the market contain harmful toxins that can seriously harm dogs. Have you ever walked down the aisle shopping for a toy and noticed all of the colourful bright options? These toys are filled with dyes that have known chemicals that can cause cancer and other serious health issues. Reports conducted show that even pet tennis balls contain absurd amounts of lead. CannaCanine offers two great natural products to help those natural chewing craves your dogs get! These are some amazing and natural options to help your pup quell their chewing urges. Instead of chewing on harmful toxic chew toys, the CBD Elk Antler Chew and Raw Hemp Rope Tug are a safe and natural alternative. Avoid rawhide chews made in China which can be full of toxins and other deadly chemicals. Your favourite pair of heels will be saved and won't be ruined for date night because your dog thought your shoes was their date for chew night! These products can be purchased at the CannaCanine store.